The effects of additional weight on a person's body are dramatically demonstrated with this useful teaching tool, which simulates the "look" and "feel" of excess body fat. By inserting weights in varying increments into the vest's interior pocket, the wearer can experience the additional weight and limited range of motion that are associated with obesity. Two versions are available. 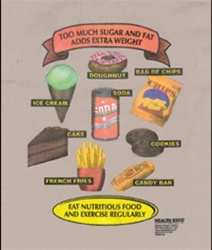 The child version, which includes a total of 15 lb of weight (one 5-lb weight and four 2 ½-lb weights), has a kid-friendly front panel that is a visual reminder that foods with too much sugar and fat can lead to overweight and obesity. An excellent way to start group discussion about healthy eating habits.